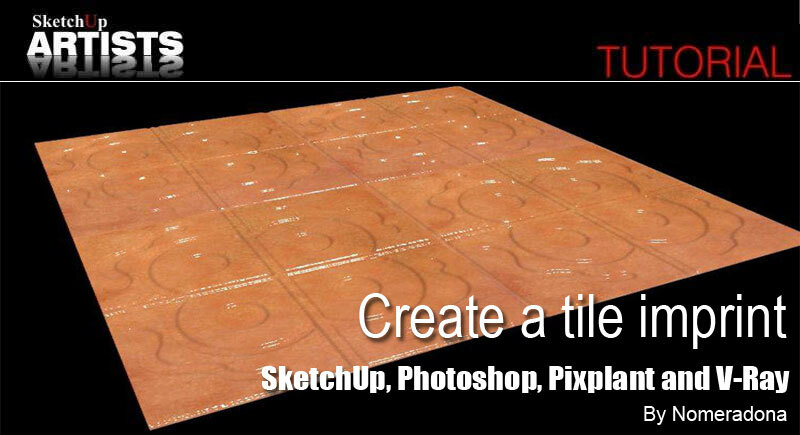 The idea behind this tutorial is to help you create a tile imprint design from scratch. I will move from one software to the next to accomplish each task. In this tutorial I will share my experience in preparing my textures using Photoshop and Pixplant. I will then demonstrate how I will use them in V-Ray for SketchUp. 1. 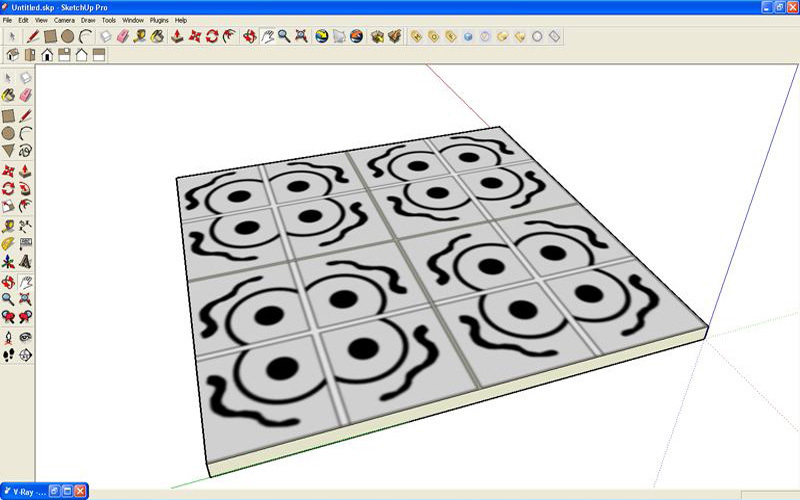 Let me begin by using SketchUp for my tile design. I could use Photoshop directly, but I prefer SketchUp as I am used to working with it and I want to introduce it for this particular purpose. Here I modeled a 30cm x 30cm tile. I then quickly drew my design using Freehand, Arc, Offset and Paint Bucket Tool. Once I finished the design, I mirrored it in both directions, creating four tiles. 2. 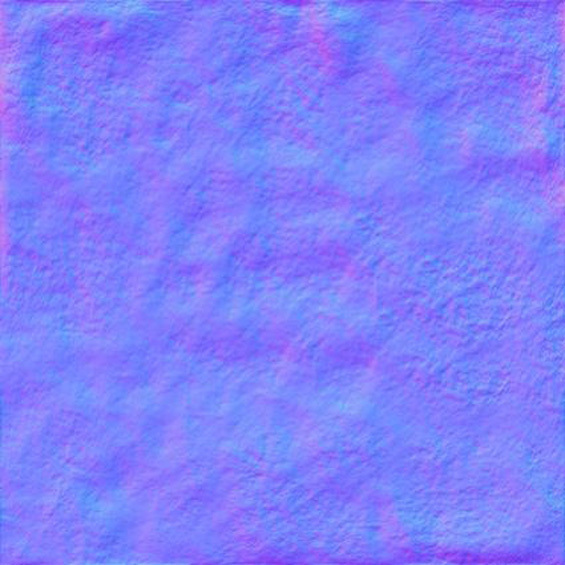 I will now export my tile design imprint as a jpeg for the purpose of creating a displacement map in Photoshop. 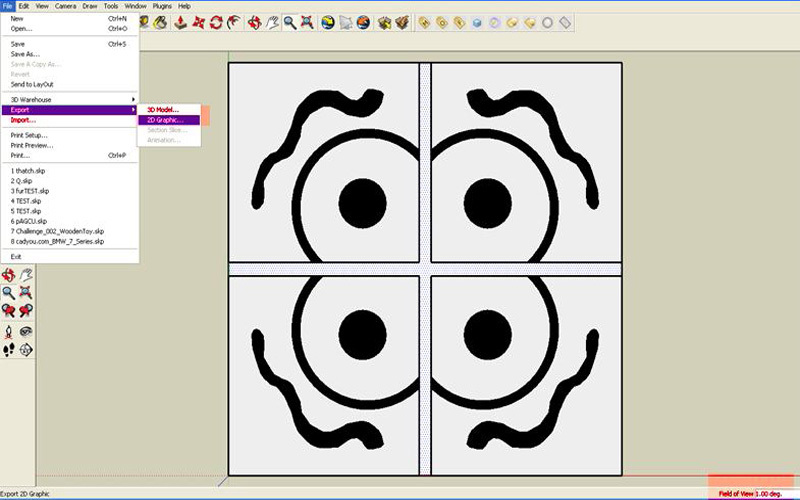 I clicked the Zoom Tool in SketchUp and typed “0” in the Measurements box to get parallel projection. I then clicked Top View using the Views Toolbar. The model is now ready to be exported as a 2D graphic in jpeg format. See the image below. 3. 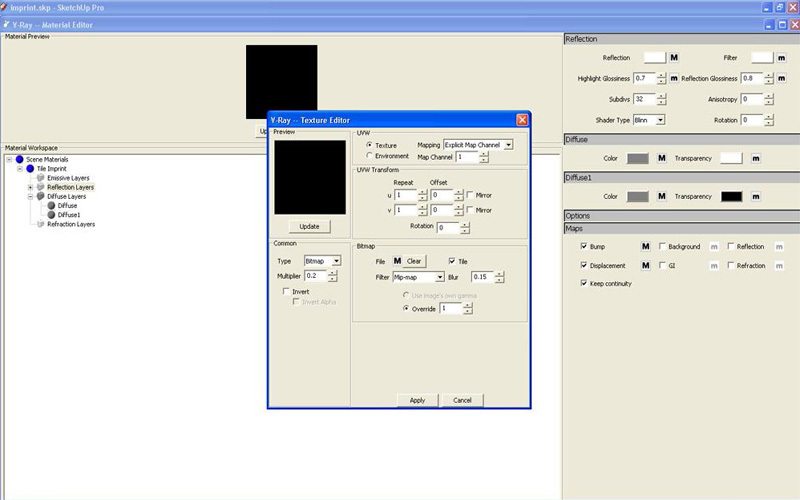 Open Photoshop and load the exported image. To create a displacement map, I simply copied the image into another layer and applied a Gaussian blur filter to it. I did this to achieve a smooth transition between blacks and whites. In V-Ray for SketchUp, the whiter the areas are the, higher the displacement. 4. Save this material as your “displacement map”. 5. Here is another material. 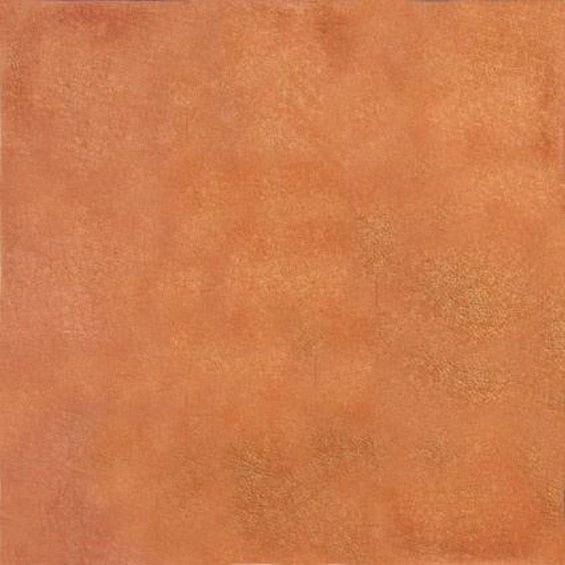 I downloaded this one from the Net by ‘Googling’ and typing “Terra Cotta”. I will remove those grooves using the ‘Clone Stamp Tool’ in Photoshop. Once done I will save it as a jpeg image. 6. Below is a seamless material I have done using Pixplant (you can download 30 day trial). The jpeg image that was done above was opened in Pixplant and created a seamless Diffuse map. 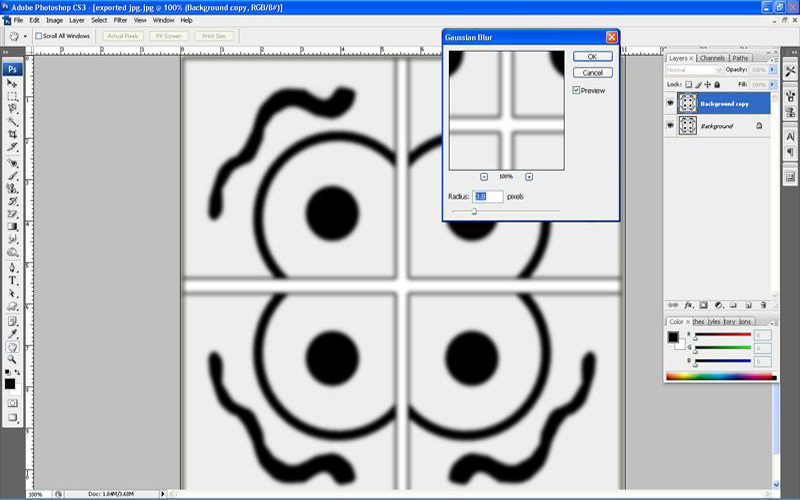 You can also use Photoshop to create a seamless texture by using a filter called “Offset” and remove the unwanted seam using the “Clone Stamp Tool”. I found Pixplant to be a really cool software for doing this. 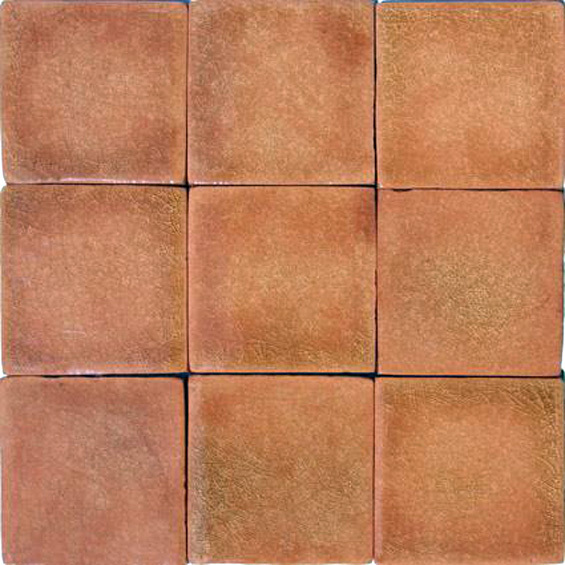 The jpeg material below will be the base color of the tile. I also saved a “Normal map” which will be used as a Bump map. I found using “Normal map” in Bump map slot gives a more effective map rather than a black and white Bump map. 7. 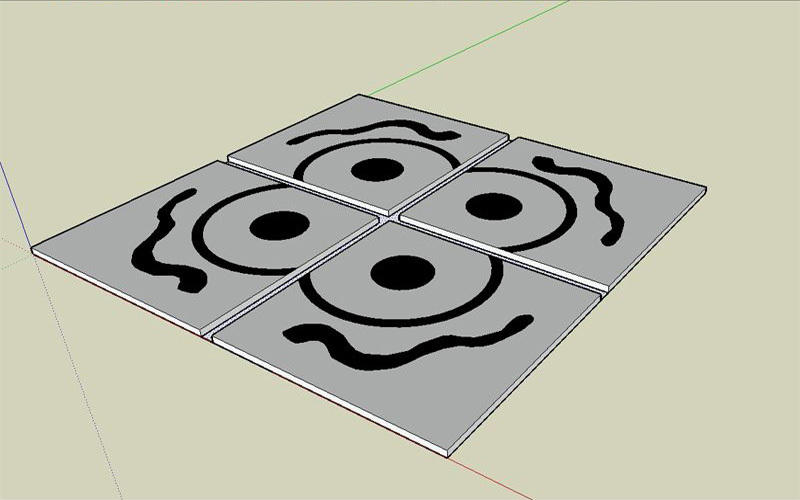 The image below shows the setup of the floor tiles in SketchUp. Here I did a 60cm x 60cm plane. I painted the Displacement map on this plane. This is very important because the mapping of the Displacement map will follow exactly the UV’s of this Diffuse map. 8. 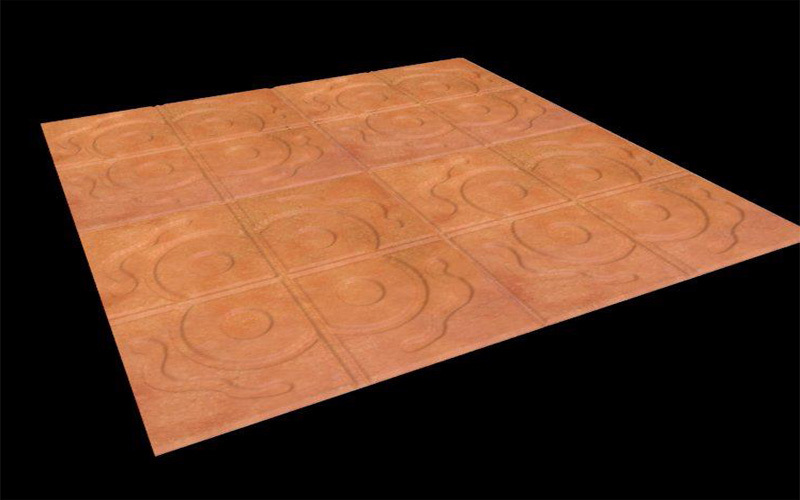 The image below shows the settings in V-Ray for the imprinted tile material. 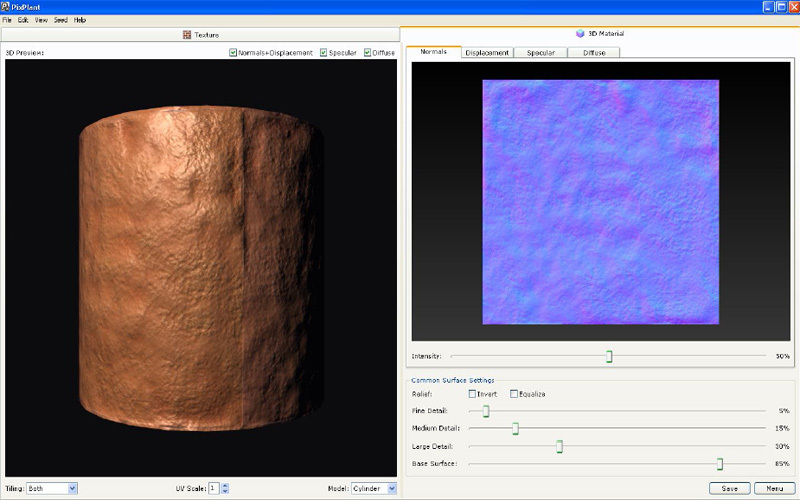 Creating another Diffuse layer (Diffuse 1)….load the brown Terra Cotta Diffuse map by clicking the small “m” beside the Color box of this new Diffuse layer. It is important that the old Diffuse layer (Diffuse) will not have any effect on the material other than its UV map setting…the transparency color must be turned into a complete white. Load the “Normal map” under the Bump slot. Load the “Displacement map” under the Displacement map. In this particular exercise the multiplier of both Bump and Displacement map are 0.2. Finally, create a Fresnel Reflection map with .07 – .08 Glossiness and 32 Subdivision. I hope you have learned something new here and you find it useful in your future projects. Thank you so much for your works, Nomer!